The Vilah Bloom Cafe Crossover bag is what diaper bag dreams are made of. If diaper bags dreams were a real thing. 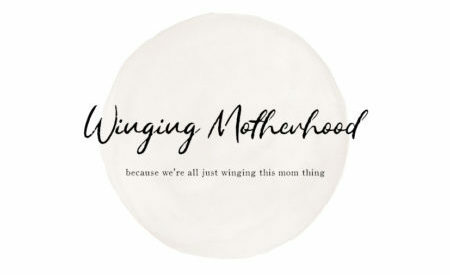 Which, if you’re a mom, they totally are. 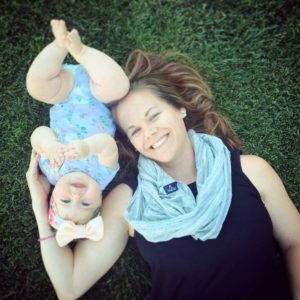 You sacrifice a lot when you become a mom. It’s just part of the gig. Your sleep. Your sanity. Your clean hair. But your fashion sense doesn’t have to be one of those things, at least not when it comes to your diaper bag. I have a modest collection of designer handbags, most of which were purchased when I was a young, single, working professional. They range from small coin purses to over-sized bags that my 15-month old could probably fit in. Speaking of my 15-month old, I don’t think I’ve carried any one of those bags since she was born. When I’m out with her, I carry a diaper bag. When I’m commuting back and forth to work, my Sarah Wells Kelly pump bag accompanies me. And when I venture out without her…haha, just kidding, who has time for that? There is so much to love about this bag, I almost don’t even know where to start. Rather than save the best for last, I’m going to put it out there now. The feature that caught my attention about the Vilah Bloom brand was the built-in, easy access wipe dispenser. That’s right. Built-In Wipes Dispenser. Not the feature you were expecting? Especially after all that talk about designer handbags and my longing for fashion? 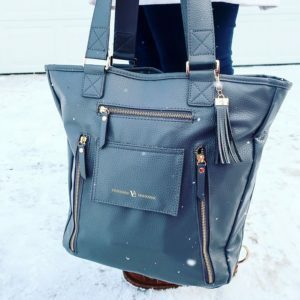 I didn’t say it was the fanciest feature, or what I love most about the bag, but it is something that is unique to the Vilah Bloom brand and really makes my life so much easier as a toddler-toting, diaper-bag-carrying mom. I have found that baby wipes can solve just about anything. There’s the obvious use. And then there’s sippy cup spills, runny noses, snack cup disasters and you would be amazed at how well those wipes work to dust your dashboard and remove your make-up. If you don’t use baby wipes for all that, are you even a mom? It’s pretty great not having to dig for them when I need them in a pinch. I just open the flap on the front of the bag and there they are, readily available, accessible with one hand. Moving on. The Cafe Crossover collection is my favorite line from Vilah Bloom. Available in black (dark roast), cream (whipped coconut) or grey (mountain grey cafe), these classic colors coordinate so well with just about everything in my wardrobe. The faux vegan leather exterior is luxuriously soft and very easy to wipe clean. With its optional shoulder straps the Cafe Crossover offers 4 different carrying options: Shoulder, Crossbody, Backpack or use the built-in stroller clips when you’re on the go and really want to be hands-free. Lately I am digging the backpack style. Having both hands free to wrangle my toddler really comes in handy. The straps are perfectly placed at the top of the bag, just the right distance apart so they don’t slide down my shoulders. They’re thin, but wide so they don’t dig in. 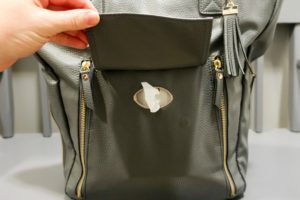 When I don’t want to use it as a backpack, the straps unclip from the bottom and tuck discreetly in the large exterior pocket on the back of the bag (and the same goes for the shoulder straps when I’m backpacking it, there are two stowaway pockets for the shoulder straps – one on the front and one on the back). Now let’s talk about pockets. This bag has some serious storage. There are the two magnetic closure stowaway pockets that I already mentioned for tucking away whichever straps you’re not using. The back of the back also has an extra large exterior pocket, which is where I store my tablet or you could toss a magazine or book in there. Flip it around and you’ll find an insulated ‘breezeway’ pocket, perfect for keeping your bottles and snacks cold (or warm). The pocket for the wipes sits just in front of this insulated pocket. Open the bag and you’ll discover six more pockets: two organizational pockets (I use one for diapers and the other for my wallet), two bottle pockets (also great for smaller items like diaper rash cream and sunscreen), one large padded electronics pocket and a smaller zippered pocket. If you need a little extra space, you can open up the bag with the expandable zippered sides. That extra inch really makes a difference sometimes! This bag is the perfect size at 16″ long, 13.5″ high and 4.5″ wide. A large, plush changing mat is included as is an interior swivel key/pacifier clip. No more digging for your keys or pacifiers at the bottom of the bag (but if you do, at least you’ve got easy access to wipes to clean it off)! The lining is water resistant and features the signature Vilah Bloom print. The whole bag is decked out with gorgeous gold hardware, including studs on the bottom of the bag to help keep it upright when you set it down. The little tassel is just the icing on the cake, providing a nice touch of feminine flair. I have been wracking my brain to come up with a downside to this bag. Maybe the price tag? I know $170 isn’t affordable and may not be reasonable for everyone, but this is a bag you’ll likely use looooong past your diapering years. In the few weeks I’ve had it, every single compliment has been made without realizing it was a diaper bag. Everyone thought I treated myself to a new purse (yeah right!). If you want to get your hands one one of these beauties, visit the Vilah Bloom website here and browse the collections. With a variety of styles to choose from, you’ll definitely find something to match your own personal taste. 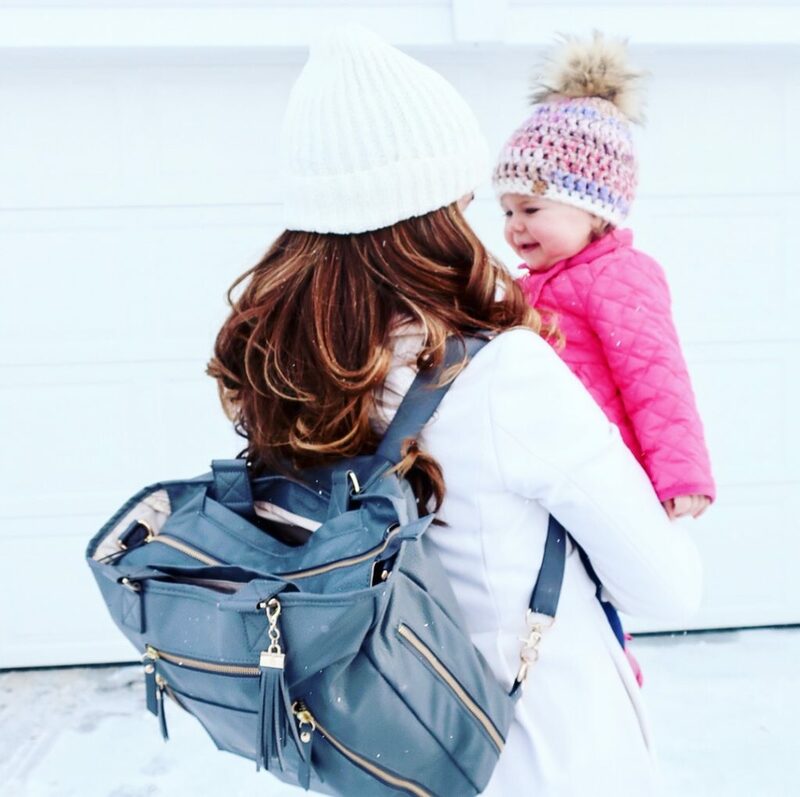 What’s your favorite way to carry your diaper bag? 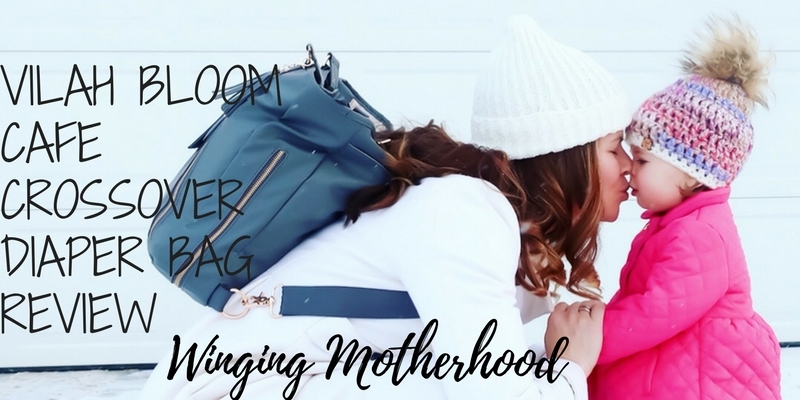 I was definitely a shoulder strap mom until now – I can’t believe how much easier everything is when I carry my bag backpack style! I received this diaper bag for free in exchange for my honest review. All opinions are my own. This is a great review ! I love this point, A large, plush changing mat is included as is an interior swivel key/pacifier clip.No more digging for your keys.. Thank you for sharing it . Wow! Awesome bag review. Serves as dual purpose both for fashion and for Mom duties.